Modern snowshoes are far from the traditional ones, thanks to the new materials used in their design, their lightness and resistance and how easy they can be adapted to the hiker´s boots. 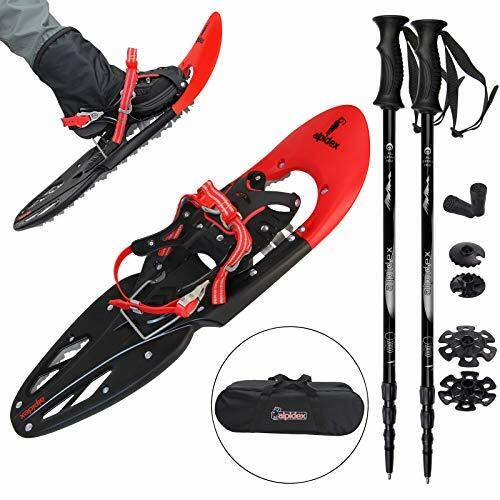 First, there is the so-called automatic snowshoe, which fit and release quickly to a special shoe designed for it, and also takes longer to freeze. However, this system has the disadvantage that with intense cold the frontal fixation can break and we would lose our mean of movement in the snow. Next there are the ones that adapt only to those shoes that can also fix crampons, also called clamp. And finally there are the ratchets, which thanks to their special straps can be fixed to all types of footwear. 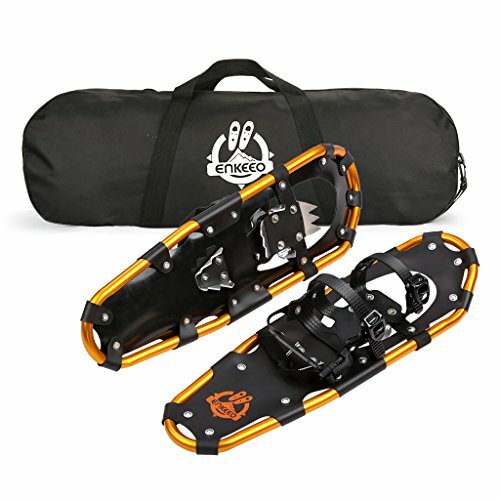 This type of snowshoe has become popular thanks to the development of its strap system and the comfort of being able to use them independently of the shoes that we use. With a very long frame and large surface area, they are very stable in deep snow. Very good for long walks on horizontal terrain, but not recommended in mountain landscapes such as our Pyrenees. However, they are the ones of choice for areas such as the snowy plains of Scandinavia, Siberia or Canada. They are thought to be the first type of snowshoe, born in Central Asia and then taken to North America during migration movements. As the name implies, they are very appropriate to develop the proper technique to walk in the snow. It is characterized by being much smaller than a normal size snowshoe. They are particularly useful in the approach to peaks and for mountain runners, as well as for people of very little weight and children. However, the small surface they offer makes them ineffective in deep snow. Very similar to the Canadian ones, its large surface allows long walks in deep snow. This same characteristic makes them dangerous when facing hard slopes. They are the most used, since its surface is suitable for any type of terrain. Although the most professional are metallic (made of aluminum or manganese), most are made of plastic and other lightweight materials in order to avoid adding weight to the hiker step. Its design is quite standard and versatile, although narrower models are also manufactured for flanking, ascending or lowering paths in hard snow. 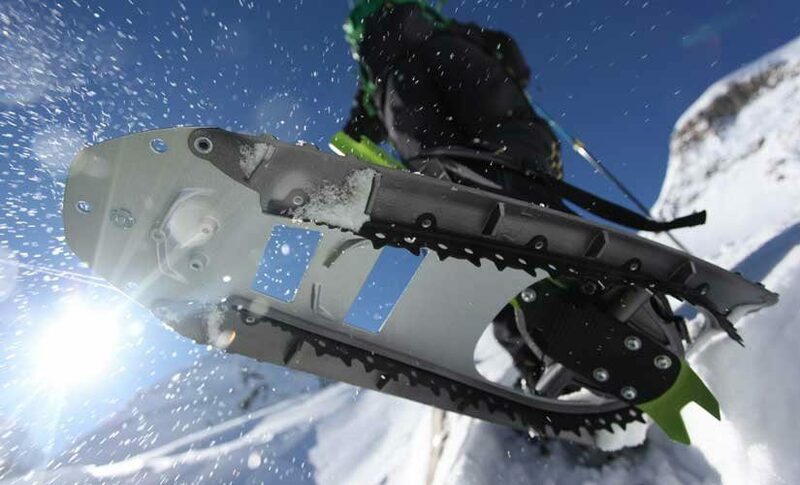 Its design includes six or more spikes under the fixation to facilitate climbing, plus three front spikes to bite the snow. The metallic models lack these spikes, cause they are very sharp and do not need them. 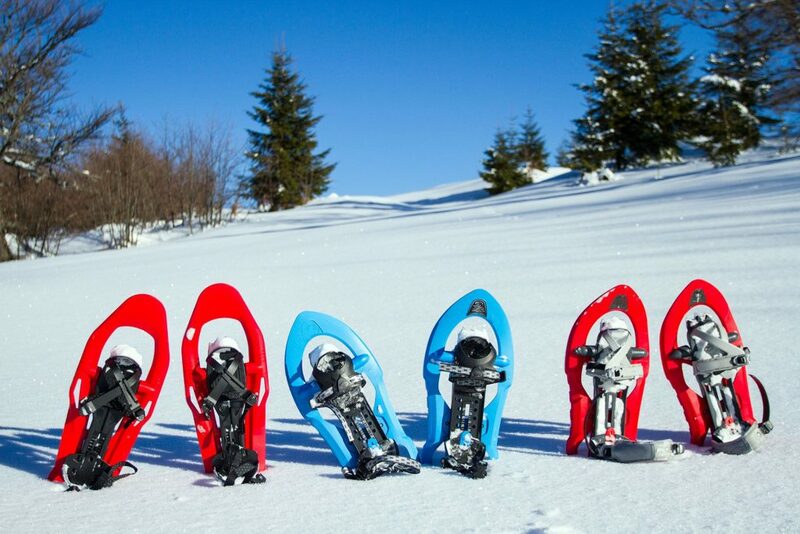 Although they work well in many terrains, they do not surpass the plastic snowshoes in the high mountains. Similar to skiing, the mountain snowshoe has a fairly steep rise that allows it to adapt well to hard slopes. 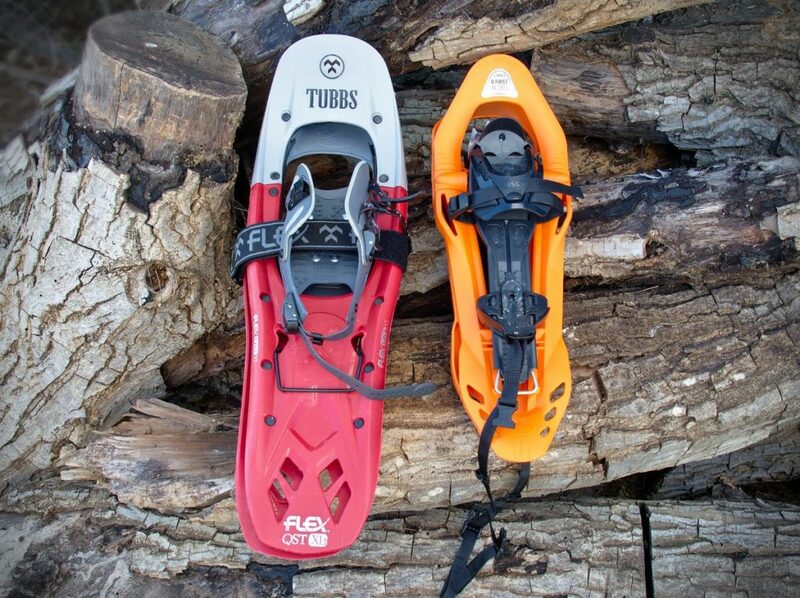 Some plastic snowshoes models offer the possibility of adding a crampon under the fixation, to improve the movement in hard snow. 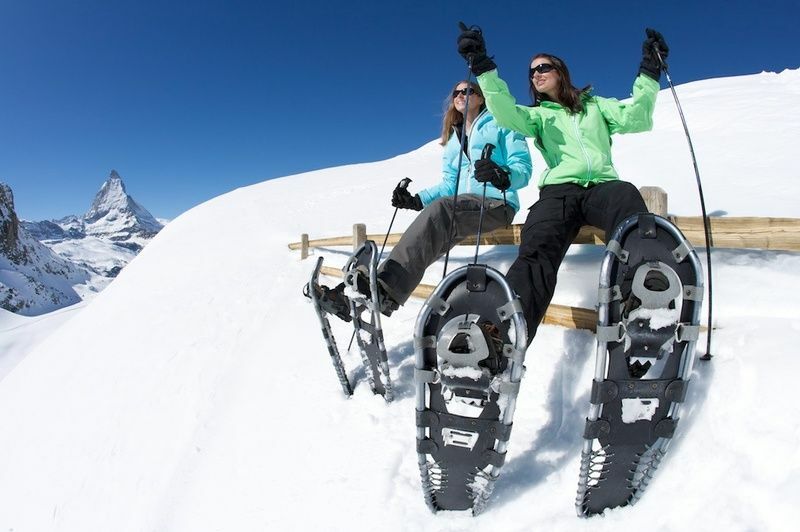 We recommend choosing brands like Altus, Salewa, or Baldas.In particular, the Inook snowshoes have very good performance, both in its small corpulence model (40 to 80 kg) and the large one (55 to 110 kg). When deciding on weight, remember that the snowshoes not only will support your body mass, but also that of your gear and your backpack. The prices of the snowshoes vary. Keep in mind if you are looking for something for initiation or something more professional and the type of trail you are going to cover. Here there is a model with aluminum frame, which will guarantee you a long durability. They come with a back and there are several sizes depending on the weight of the person to wear them. The straps are adjustable. Another model here, with wider surface, which will ease our walking on soft snow. They include a double traction system to hold your boots much better and they have carbon nails and a complement for better ascents. 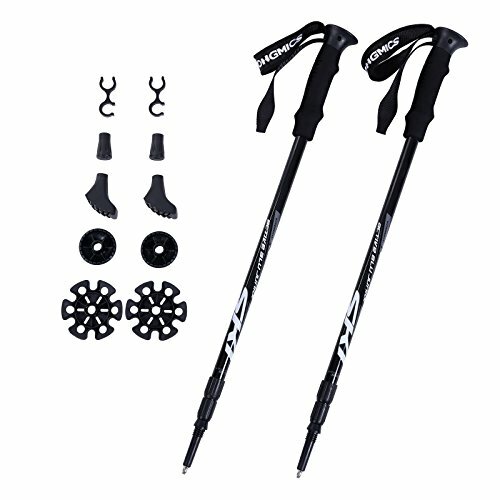 This is a very complete model and optionally you can buy them with trekking poles. To complement your snowshoes, the best accessory you can get are a great set of trekking sticks. These Songmics, made of aluminum, include an antishock system for a more comfortable experience. They are adjustable, anti-corrosion and stainless. Of course, they include different plugs, for different surfaces, as well a screw-on snow tips. My advice is that you choose within the highest price range, because this way you avoid having to buy others soon, either by breakage or erosion. Do not forget to buy walking sticks with your snowshoes. These will facilitate the balance in the ups and downs and to overcome obstacles of all kinds. This implement is much easier to master than cross-country skiing and its technique is much simpler than what you will have to learn to face a climb. 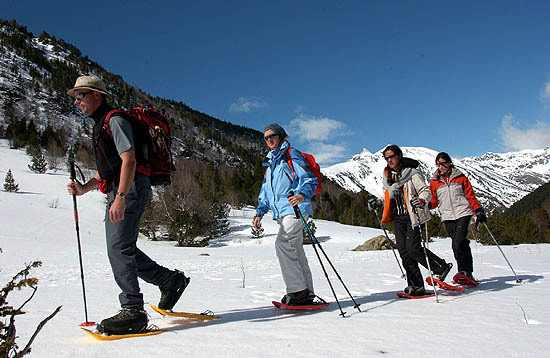 However, there are some basic maneuvers that you must learn before risking going to the mountain with your snowshoes. We recommend that you make a couple of previous outings on simple snowy trails, so you can adapt to walk with the snowshoes before trying more demanding trails. A little practice is all that is required to master them, and such as skiing, snow quality and terrain slope are what define how we have to vary our technique. The first thing is marching on flat terrain. This should not be difficult, especially in compacted snow. If you use mountain snowshoes you will notice that the fixing spikes are properly nailed and give you stability when walking. The body posture is an important element here: keep the bust upright and the body as vertical as possible, which helps you to progress quickly. 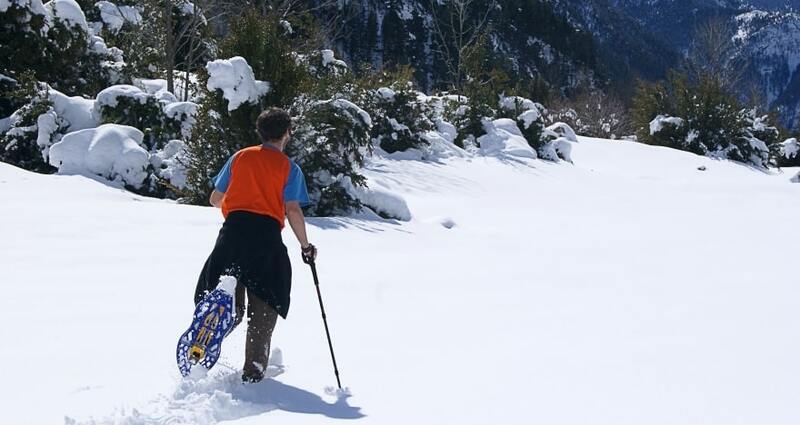 If the snow is very deep or crusty, it will be necessary to raise the snowshoes a little at each step. If not, it is easier to just drag the implement on hard or dusty snow, just like ski touring. This is known as the skater’s passing. Then you can move on to more dangerous terrain, but that is the subject of another conversation. For now, do not let the snow stop you: put on your snowshoes and go for a walk. Who knows? Maybe we will see each other on the road one of these days.